Berzerker_prime's Adventures at Ring Game Spring 2003! Well, I wanted to play Eowyn. But of course, since it was the first game after the second movie came out, everyone wanted to play Eowyn and so I didn't get it. But, all's fair in the lottery system. Playing Leaflock the Ent was just as fun, if not better. The big challenge for this costume was how to make costume to be a walking tree in the first place. I didn't have to worry about weapons or armor, but, how to look as though I was, as Professor Tolkien described Leaflock, "covered in leafy hair" was an interesting problem. I decided to run with the leafy hair idea and go for a sort of a willow look. To that end, my hair was down. For the rest of the willowy bits, I sewed parts of a grass hula skirt to a pair of gauntlets and to a piece of grey-brown denim that was made into a sort of backpack piece. Unfortuneately, it isn't visible in the picture. I scavanged a discarded brown shirt from my dad and I used my old faithful pair of brown jeans to get the browness of a tree trunk. But, I didn't seem to be leafy enough yet. 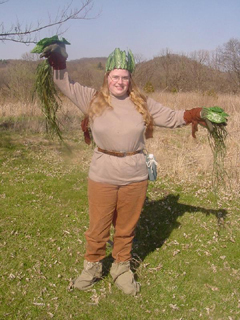 I solved this problem by getting some cheap fake foliage, cutting the leaves off it, and sewing them (by hand, mind you) to an old pair of gardening gloves and a braided brown yarn circlet. Now, the only problem was that my shoes were still visible and not very tree-like. I solved that problem with a good old pair of spats to which I sewed sticks. All told, my costume garnered me nine costume points out of 15. The fun thing about playing an Ent is that depending on where you are, your point total differs. So, depending on whether or not I was in the Entwood and touching a tree, in the Entwood, in a woods touching a tree, in a woods, out in the open touching a tree, or just out in the open, my point total ranged anywhere from a darn good 69 (no jokes, please) to a fairly measly 24. Needless to say, I did my darndest to be touching trees and staying in woods. I started my day in the Entwood with the other four Ents and we all got bounced right away by a passing group of Vampires and Orcs. They serenaded us with the phrase "dead Ent" over and over to the tune of the Pink Panther theme. After that, I spent a good deal of time hanging out with the crews from Rohan and Gondor as we stared down the hoard at Isengard that was the White Hand. Fine moments include Gandalf bouncing the Nazgul, getting two Hobbits safely to Gondor using diversionary tactics ("Hey! There goes the Menace! Whatever you do, Saruman, don't look in the opposite direction! "), and successfully defending Gondor. All our patience payed off. After all of that, the Menace and various other happenings broke our group up a bit. With a smaller group, I made my way toward Mount Doom for a daunting two hour seige of the place. In the process, I was bounced twice more, once by the Menace, and once by a biiiiggg group of evil. The game was actually lost once and restarted. Good lost to Sauron both times. I'm beginning to think the sheer number of evil makes it pretty darn hard. Fast facts: This game represented a number of Ring Game firsts for me; first time to charge up Mount Doom, first time bouncing members of the other team (defending Gondor! Wooo! ), first time playing something other than an Elf. 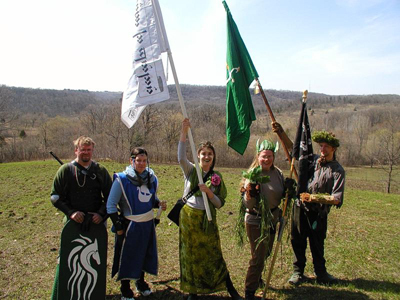 Gag costumes for the game included Great Flaming Denethor, Opera singer Mouth of Sauron, Pimp Daddy Gandalf (AKA G-Money), and Smokey the Beorn. A new record of an even one-hundred was set for Menace kills. And this game included more players than a Ring Game has ever had. A beautiful day and a beautiful game!